Israeli Intelligence Minister Yuval Steinitz noted that since Israel withdrew from Gaza in 2005, Hamas had used the territory as a staging ground for rocket attacks, launching more than 14,000 rockets and mortar bombs [it is not always possible to tell the two apart]. Since Israel withdrew from Gaza in 2005, the IDF reported in 2014 that terrorists from the strip had fired more than 8,000 rockets into Israel. At the outset of the war in 2014, he estimated that the Hamas had about 10,000 rockets on hand. By the end of July 2014, he reported that some 2,600 had been fired, and another 3,000 had been destroyed by Israeli combat operations. Defense Minister Moshe Yaalon told an economic conference in Tel Aviv in September 2014 that the HAMAS began the conflict with 10,000 rockets and still had about 2,000 left. Of the thousands of rockets launched by terrorists at Israel since July 8, by 30 July more than 280 had landed inside the Gaza Strip. By comparison, in 2002, Israeli papers estimated that the HizbAllah had about 10,000 rockets. In his May 2005 “Resistance and Liberation Day” speech, Sheikh Nasrallah, the HizbAllah’s charismatic leader, bragged about possessing “more than 12,000” rockets. A noted Israeli analyst disclosed that on the eve of HizbAllah's 2006 campaign, the HizbAllah had about 14,000 rockets, of which about 10,000 were “short-range” (i.e. with a range of 20 km or less). 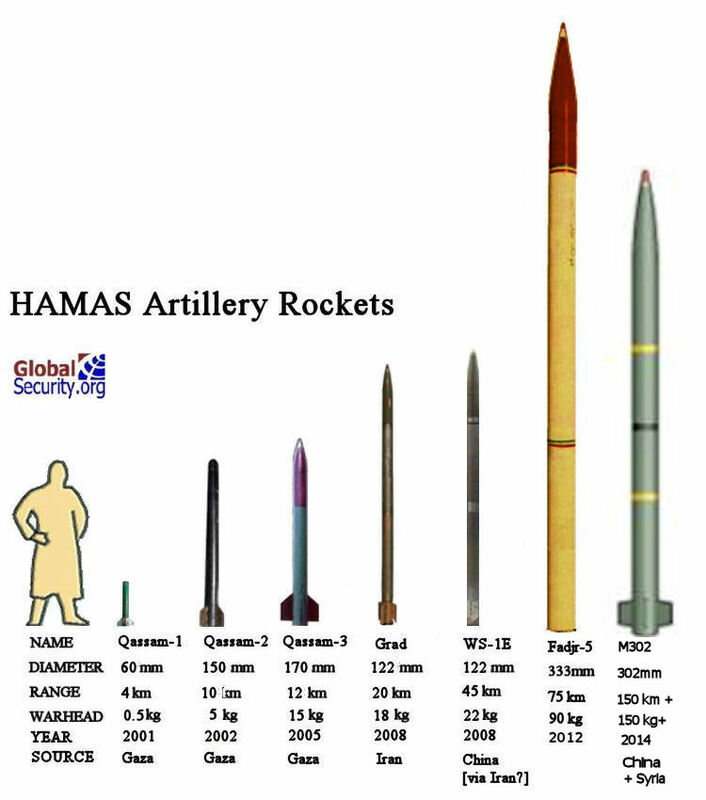 July 2014 witnssed yet another escalation in HAMAS rocket capabilities with the introduction of the new longer range Khaibar-1 M302 rocket, capable of targetting much of the Israeli population. On March 5, 2014 the Israeli Navy intercepted a shipment of “dozens” of rockets identified as “M-302" rockets aboard a cargo ship name the Klos-C in the Red Sea. The rockets were being shipped from Syria to Iran and destine for Sudan where they could be taken through Egypt to Gaza. The M-302 rocket is a Syrian-made munition that can launch a 375-pound warhead as far as 125 miles. According to Israeli media reports, the model intercepted on March 6, 2014	was an A302, which is five meters long and with a total weight of 500 kilograms. It has a range of 90 kilometers and carries a 170 kilogram warhead. 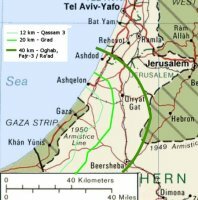 In a Hizballah attack on August 4, 2006, what was evidently a 302 mm rocket landed close to the Israeli city of Hadera, some 90 km south of the Lebanese border, the southern-most hit of any rocket fired against Israel during the war. The system is clearly not related to any known Soviet/Russian or Iranian MLRS. It has long been thought that the M302 rockets are Syrian derivatives of rockets for the Chinese WS-1 and/or WS-1B MLRS. The WS-1 (Weishi or “Guardian”) series rockets are visually similar to the Khaibar-1, and the launchers also share some characteristics. Production of these systems is done under license in Turkey and more recently in Thailand. November 2012 witnessed a major escalation of HAMAS rocket capabilities, as the Iranian Fajr-5 artillery rocket was employed for the first time. 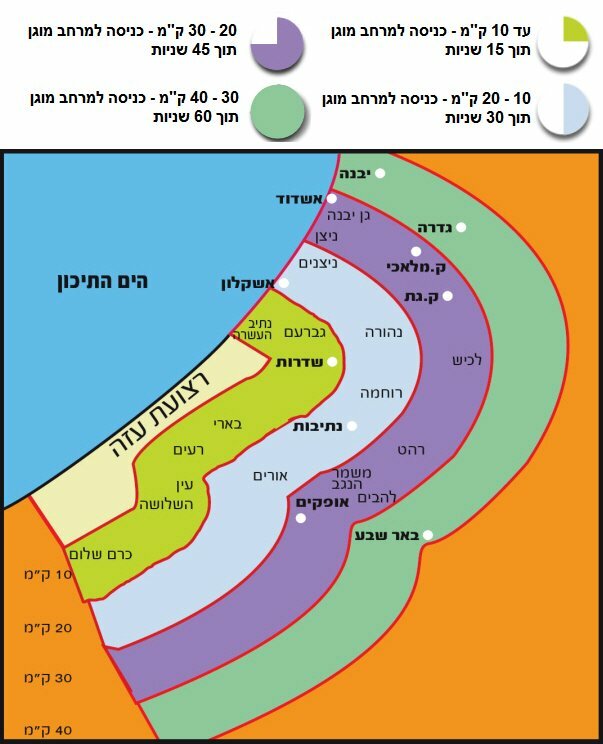 With a range of about 75 kilometers, it had twice the range of rockets previously used by HAMAS, and brought Tel Avic and Jeruslalem within range of HAMAS attacks. At the outset of Operation Pillar of Defense, the IDF targeted a significant number of long-range rockets sites (over 40 km) owned by Hamas. This deals a significant blow to the terror organization's underground rocket launching capabilities and munitions warehouses that are owned by Hamas and other terror organizations. The aim of targeting these sites is to cripple the terrorist organization's rocket launching and weapons build-up capabilities. One Fajr-5 [range of about 75 km] launch site that was struck IAF aircraft was located in close proximity to a mosque and other civilian structures. Sirens went off late Thursday 15 November 2012 in Tel Aviv sparking a panic and nearly crippling mobile phone service after missiles fired from Gaza approached the city. Israeli officials say the missiles fell into the sea. Palestinian militants issued a statement claiming responsibility, saying they had fired Iranian-made rockets. 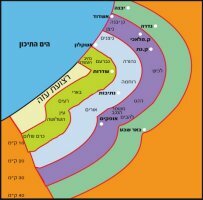 It is the first time sirens had sounded in Tel Aviv since the Gulf War in 1991. Tel Aviv is about 80 kilometers from Gaza, indicating the use of the Iranian Fajr-5, which has twice the range of the rockets previously used by HAMAS. On Friday 16 November 2012 one rocket landing in a field outside Jerusalem. 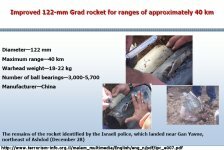 Yossi Mekelman, a regional expert at London-based Chatham House, told Radio Free Europe on 17 November 2012 that the Fajr-5 missiles were smuggled from Iran to Gaza through Egypt's Sinai Peninsula. "The assumption is that they arrived through the Sinai Peninsula through the tunnels [to Gaza] because since the end of the Mubarak regime the border [between Egypt and the Gaza Strip] at Rafah is quite open," Mekelman says. "And if you remember, Israel two weeks ago attacked an arms factory in Sudan. So the alleged route goes from Iran to Sudan into the Sinai Peninsula, and the lawlessness in the Sinai enables the smuggling of more and more sophisticated weapons." 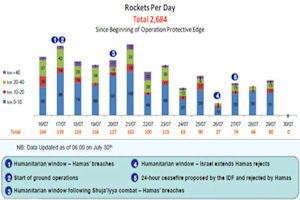 The year 2008 saw a dramatic increase in the extent of HAMAS rocket fire and mortar attacks on Israel, with a total of 3,278 rockets and mortar shells landingin Israeli territory (1,750 rockets and 1,528 mortar shells). These numbers are double those of 2007 and 2006, years which marked a five-fold increase over prior years. There was also a significant increase in the number of Israeli residents exposed to rocket fire. Prior to 2008, the city of Sderot (about 20,000 residents) as well as villages around the Gaza Strip were the main targets of rocket fire and mortar shelling. 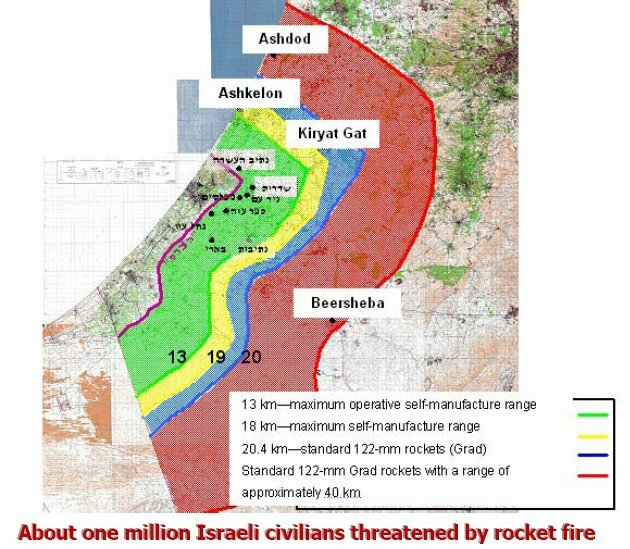 In 2008, the cities of Ashkelon and Netivot came under attack by Grad artillery rockets with a range of about 20 kilometers. 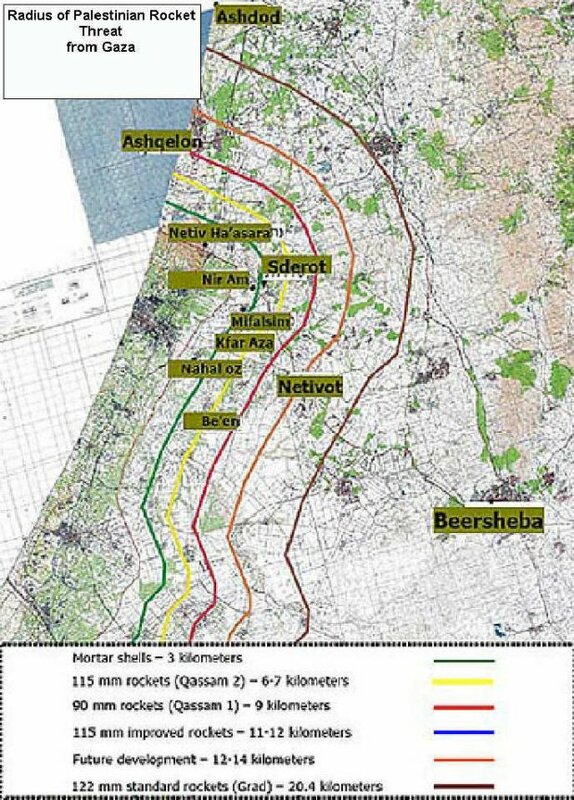 Later, during Operation Cast Lead, Ashdod, Beersheba, and other cities were attacked by a previously un-identified rocket with a range of 40 kilometers from the Gaza Strip. This rocket created a new reality in which nearly one million Israeli residents [about 15 percent of the entire population] were at risk. Israel launched an air assault on Gaza on Saturday 27 December 2008, following a series of rocket attacks on its territory and the collapse of a shaky truce that had been in effect for the past six months. Israel's military intelligence chief said Hamas' ability to fire rockets had been reduced by 50%. Hamas rocket fire dropped off sharply, from more than 130 on Saturday 27 December 2008 to just over 20 on Sunday 28 December 2008. Hamas launched a total of 40 rockets and mortars at Israel Sunday 28 December 2008, bringing to around 300 the number fired since the six- month truce ended. Hamas launched an upsurge in rocket and mortar attacks from Gaza once it declared an end to a truce with Israel on 19 December 2008. By 18 December 2008 Palestinian militants had fired at least 40 missiles into Israel since Tuesday 16 December 2008. On Wednesday 17 December 2008 no less than 24 rockets landed in the Western Negev desert area. On Thursday 18 December 2008 a further seven rockets landed in Israel. On December 24, five days after the lull arrangement ended, the cities of Ashqelon , Netivot and Sderot, the towns and villages near the Gaza Strip, the crossings and IDF bases were subjected to a massive rocket and mortar shell attack. At least 60 rockets and mortar shells were fired, most of them by Hamas. Palestinian militants fired over 40 rockets and 20 mortar shells at southern Israeli border towns in the largest daily attack since the end of a six-month ceasefire. Hamas responded by firing more rockets and mortars into southern Israel. By 15 January 2009, since the beginning of the IDF operation in Gaza (Dec 27, 2008), four Israelis had been killed and 285 wounded by rocket fire. 771 rockets and mortars had been fired at Israel. Musheir al-Masri, a Hamas spokesman in the Palestinian Legislative Council, said (Filastin al-'An website, December 24) that the rockets which had been launched were only the first message and threatened to extend the attacks beyond what had been carried out so far. He guaranteed that Israel would "be hit in a way it had never been before," and that he was not afraid of Israel threats. The population of the villages bordering on the Gaza Strip, as well as Sderot and Ashqelon, would not be secure "as long as Palestinians are not secure". 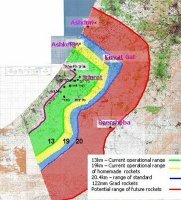 Hamas now has longer range Iranian-made rockets, and several hit near the Israeli port city of Ashdod for the first time, 23 miles [37 km] from Gaza.Israel's Home Front Command recommended that all communities within a 40-kilometer range of Gaza be hooked up to the Color Red incoming missile alert system. On 28 December 2008, two impacts of artillery rockets were identified near the towns of Gan Yavne and Bnei Darom. 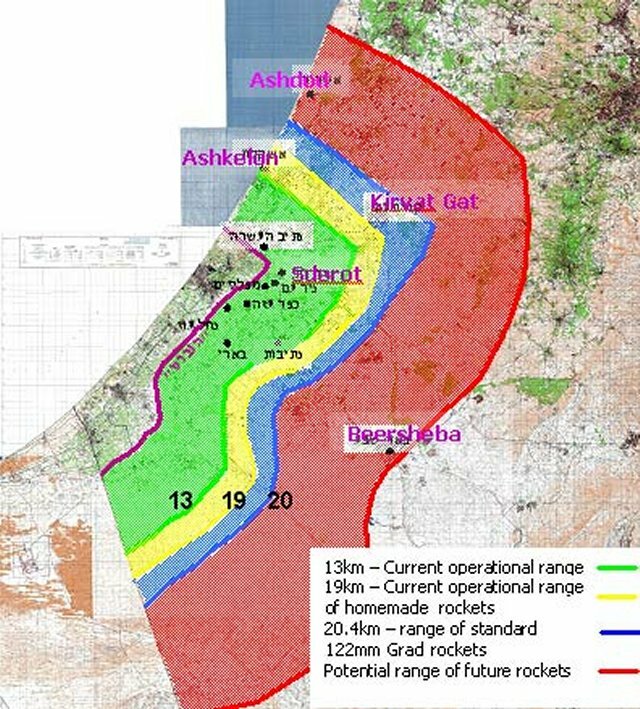 The rockets were launched from the northern Gaza Strip and attained ranges of some 33-34 km. Examination showed that they were Chinese-made rockets with similar characteristics to standard 122-mm rockets. The maximum range of those rockets is up to 40 km. While news accounts reference these as Grad rockets [the Russian nomenclature] or "enhanced Katyusha", the rockets used in the attack on Ashdod must have a range twice that of the BM-21 Grad. Photographs of a rocket that landed near Gan Yavne, northeast of Ashdod on 28 December, do indicate that it was a 122-mm rocket. This is inconsistent with the idea that HAMAS was using Iranian-made rockets, either the Oghab with a range of 34-45 km or the Fajr-3 / Ra'ad with a range of 45 km. The WeiShi [literally "Guardian", (WS) family of the multiple launch rocket systems were developed by China's Sichuan Aerospace Industry Corporation (SCAIC, also known as Base 062) in Chengdu, Sichuan Province. The WeiShi series includes the 122mm WS-1E with a ranage of 40km. The WS-1 series weapon system did not enter PLA service, and was not known to have received any orders from foreign customers. On 28 February 2008 at least 10 Grad rockets hit the coastal city of Ashkelon, about ten miles from the Israeli border with the Gaza Strip. At least 60 more Qassams, targeted Sderot that day. During the first few days of March 2008 dozens of Qassam rockets and Grad-type Katyushas were fired at Ashkelon, Sderot and communities bordering Gaza. 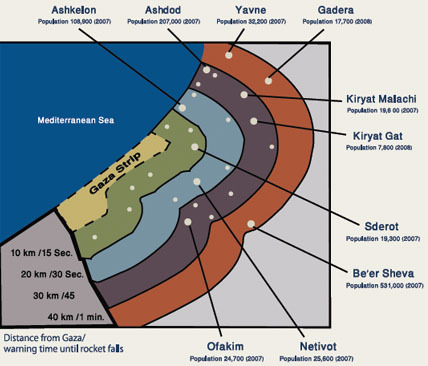 Ashkelon is only a few minutes away from the Qassam-battered city of Sderot, the principal target of Qassam attacks. The western edge of Sderot is about a mile from the border with Gaza. The Israeli Center for Victims of Terror and War found that 28 percent of adults and 30 percent of children of Sderot have post-traumatic stress disorder. 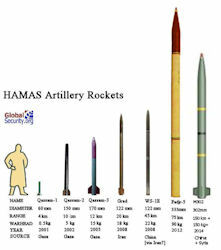 when Hamas broke open the border with Egypt, Hamas was able to bring in more of the manufactured Katyusha rockets. Production of the shorter range Qassam rocket began in September 2001, following the outbreak of the Al-Aqsa Intifada. The rockets have been manufactured and deployed primarily from the Gaza Strip although Israeli Defense Forces have seized rockets in the West Bank. The Qassam rocket is cylindrical and contains a small warhead on its tip. The rocket contains four small stabilizing wings on one end, a middle section containing the engine, and an attached warhead with a detonating fuse on the other end. The rocket is constructed from iron approximately 2.5-3mm thick. The rocket gets its name from Sheikh Izz ad-Din al-Qassam [less commonly, Izz Al-Din Al-Qassim], a militant Syrian preacher who advocated rebellion against European colonial powers in the Middle East during the 1920s and 1930s. Izza-Din Al-Qassam, a Muslim Brotherhood member, fought the French in Syria, lost and then took his fight against the British and Jewish Haganah in Palestine. He preached Jihad (holy war) and revolution against both the British and the Zionists, and organized and led the first Palestinian guerilla group. He was killed in action on 19 November 1935 in the first Palestinian guerilla action against British forces. His martyrdom triggered the Great Revolt of 1936-39. Hamas has named part of its organization after Qassam and in recent years developed the Qassam rocket. 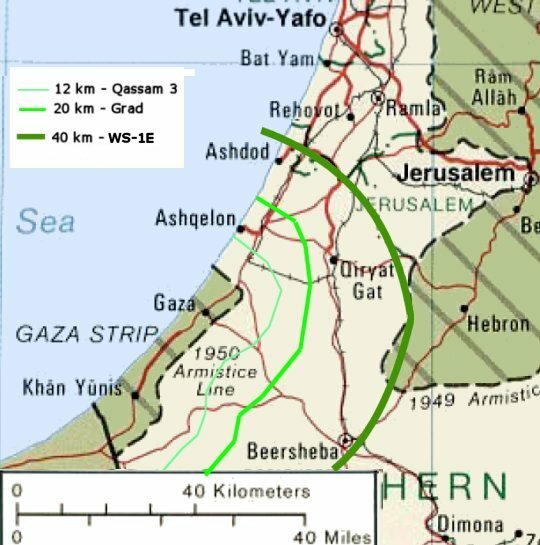 The first Qassam rocket was fired in June 2001 to a range of 1.5 kilometers (about 1 mile). By another account, the Qassam rocket was first launched into Israeli territory on March 5, 2002, by the Izz ad-Din al-Qassam Brigades. While the rocket lacks a guidance system and is very inaccurate, the initial psychological effect of the rockets upon Israel has been significant. Prior to the Qassam, Palestinian militants lacked the means to conduct long range attacks. The simple nature of the small rocket makes it exceedingly hard for Israeli officials to shut down its production. The IDF has noted that militants commonly hide a Qassam in a commercial truck, drive to a clearing near the Gaza border and launch the rocket. One Hamas website states that this takes only 15 minutes. In response to Qassam rocket attacks, the Israeli government has launched raids against production factories and launching sites within the Gaza Strip. The Israeli goverment has also installed early warning radar systems to notify communities of Qassam launches and to instruct residents to move to bomb shelters. Numerous variants of the Qassam rocket have been developed and launched. The Qassam-1, first used in October 2001, had a maximum range of approximately 3-4.5km. The rocket was approximately 60mm in diameter and weighed about 5.5kg. The Qassam-2, used primarily from 2002-2005 was approximately 180cm long, had a maximum range of 8-9.5km and could carry a payload of 5-9kg. Beginning in 2005, newer types of Qassam rockets known as the Qassam-3 were developed, possessing a maximum range of 10-12km and carrying a payload of 10-20kg. A total of about 450 Qassam rocket attacks were launched against Israel over the two years 2003 and 2004. 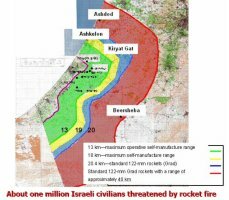 In November 2003 Israel Television Channel Two Military Affairs Correspondent Ronnie Daniel reported that the Palestinians were testing stages of a new generation Qassam 4 that was to have a range of 17 kilometers. Since September 2005, the Izz ad-Din al-Qassam Brigades developed a Qassam rocket with a maximum range of 15-16.5km range and two rockets with diameters of approximately 115mm and 155mm, respectively. Additionally, in June 2006 and again in July 2006 the Brigades fired a Qassam rocket equipped with two engines. 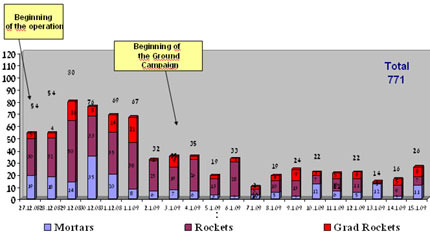 During 2004 HAMAS was responsible for an increase in Qassam rocket attacks. A rocket attack on Sderot on June 28 was the first fatal attack against Israelis using Qassam rockets. Two Israelis died in the attack. In September, two Israeli children were killed in Sderot from another Qassam rocket attack. In response to the continued Qassam rocket fire, the IDF launched a three-week operation on September 28, in which 130 Palestinians (among them 68 HAMAS and Palestine Islamic Jihad militants) and five Israelis died, according to press reports. 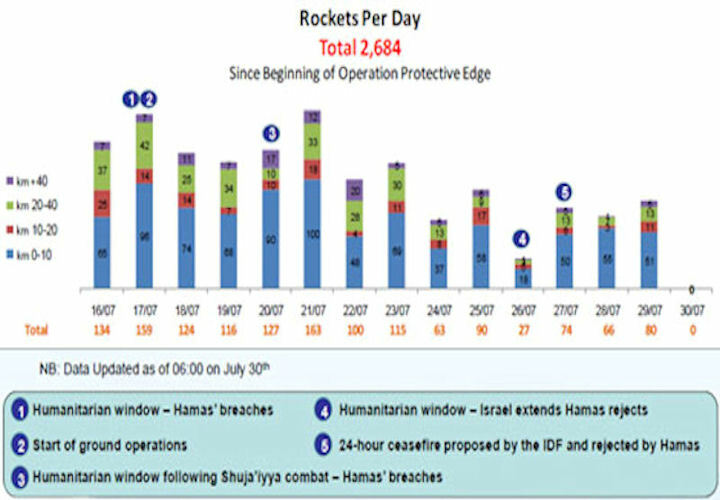 HAMAS activity dropped significantly in 2005, in part because of its adherence to the ceasefire. After agreeing to the ceasefire, Fatah's militant wing, the al-Aqsa Martyrs Brigade, claimed credit for Qassam rocket launches from the Gaza Strip into the western Negev desert that destroyed property and injured Israeli civilians and soldiers. During 2006 Israel grappled with the problem of Qassam rocket launches from the Gaza Strip. 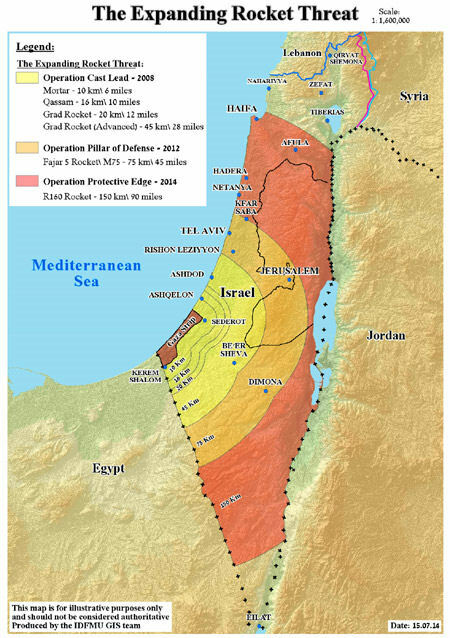 On numerous occasions, rockets struck Israeli communities in the western Negev desert, including Sderot, or landed near or in the city of Ashkelon. Evidence suggested that Palestinian terrorists were able, on occasion, to improve the range of the Qassams. On at least three occasions, longer-range Katyusha rockets were launched from the Gaza Strip. To address the problem of rocket launches from populated areas, the IDF modified its rules of engagement to permit its forces to fire on targets a few hundred meters from Palestinian homes and police positions. Early in 2006, Israeli security officials said Israel was not targeting HAMAS because it forbade its members to participate in Qassam rocket launches. The Israelis maintained, however, that HAMAS activists were providing assistance to militants from other terrorist groups launching Qassams.